Tyrocircle encourages academics to create their own academic profile where they can list and publicise their research interests. Tyrocircle permits academics to freely communicate with their students in a less formal way but at the same time delivering the same message. 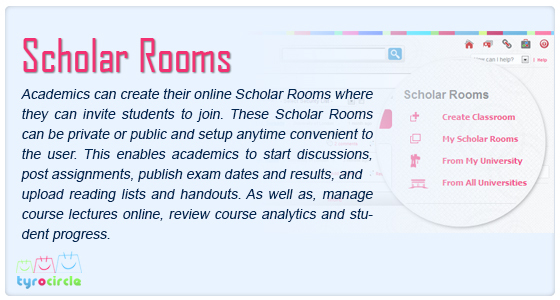 Academics can create their own online classes for their course modules where they can invite students to join. They can also manage their course lectures and seminars online, review course analytics and student progress. Tyrocircle provides students a secure community of fun and energising social learning. This equips them with the confidence they require to strengthen their student-to-student learning. Here they can request and provide help through the use of social learning flags. Students can join classes; partake in knowledge transfer and university collaboration. Tyrocircle reconnects alumni back into the university environment. For many, once they graduate they feel disconnected from their university. 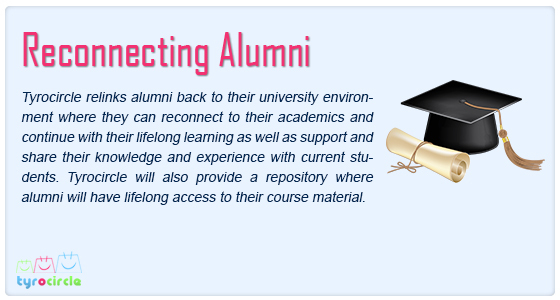 Here, Tyrocircle is relinking alumni back and providing them with the opportunity if they want to disseminate what they have learnt to others. In this way, Tyrocircle is providing a learning mechanism through networking with fellow alumni, students and academics. In addition, providing a repository where they will have lifelong access to their course material.